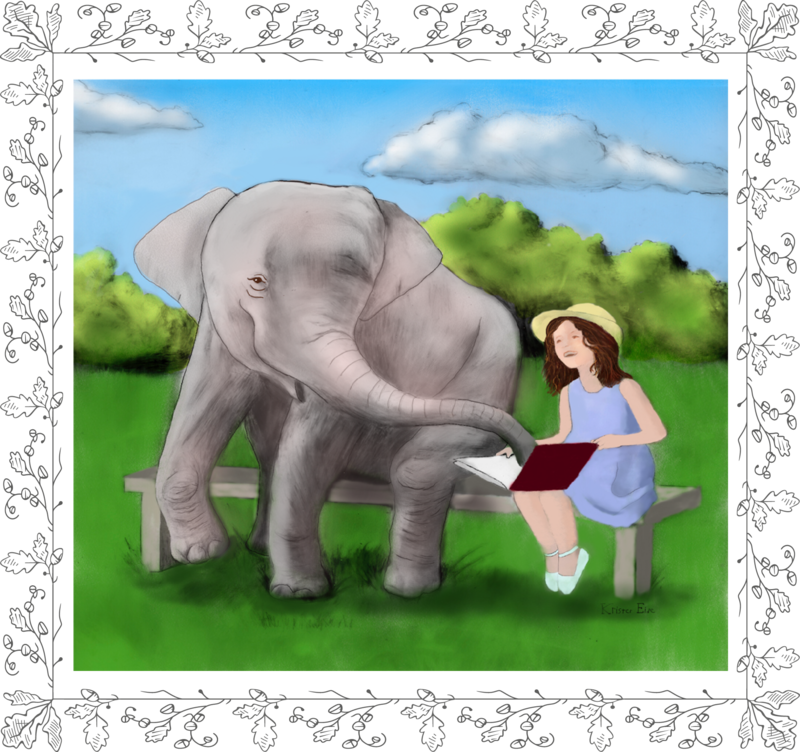 I just heard today that Hornblower During the Crisis has been accepted in the SCBWI Western Washington Illustrators Exhibit at the Washington State Convention Center! This will be my first juried group exhibition. It runs from July 1- September 30th. 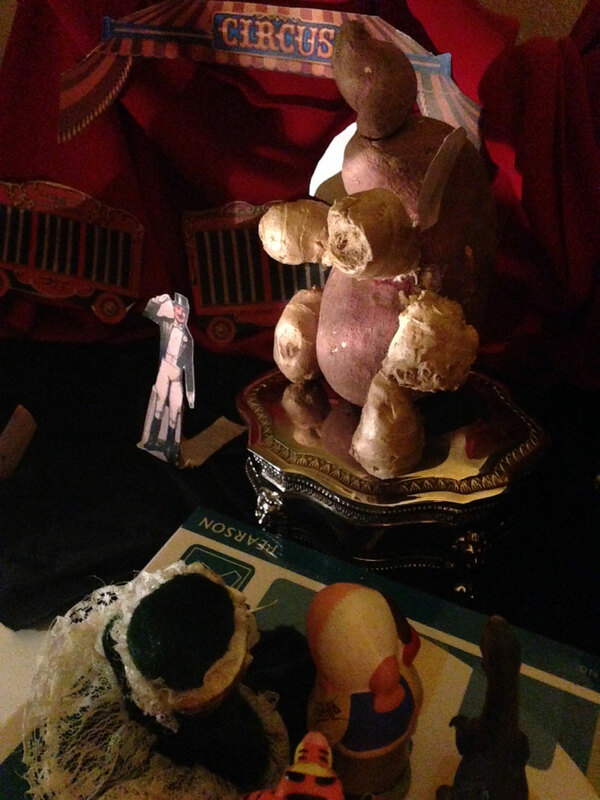 I also just dropped off some art for the Best of the Gage Exhibition. The exhibition and sale there is June 17th, and of course the Clymer Museum exhibition goes through June 25th. In addition to school, I’ve been experimenting with different ways of adding color. This past week I did some colored pencil work with the black and white owl and frog drawing. I like really like Faber-Castell Polychromos. They are oil-based, so blend with baby oil and can work side-by-side with watercolor paints or pencils. I’ve also been doing some sketching and thinking about doing some illustrations for Hans Christian Anderson’s Snow Queen. There are two good crow characters that are part of the story so I thought it would be nice to do. 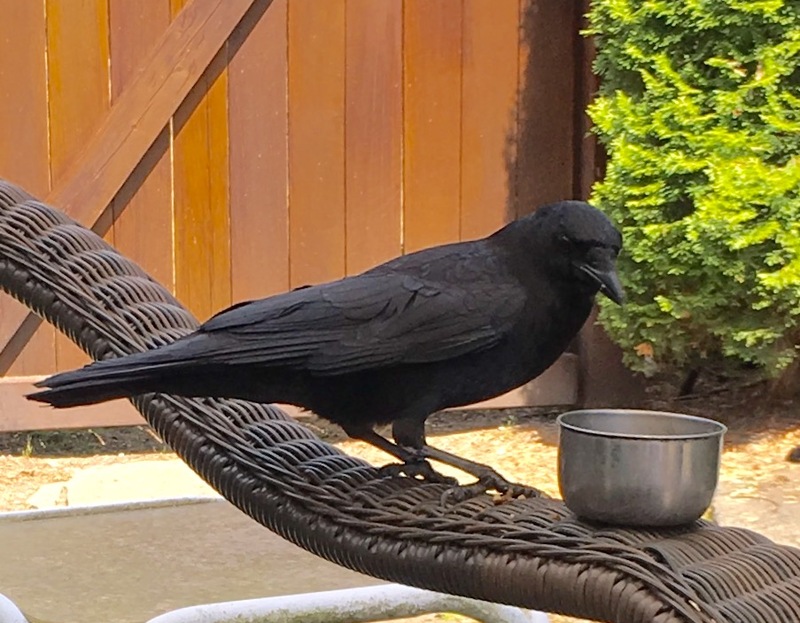 We get a lot of crow visitors in the backyard. I also saw an inspiring video today. Sargy Mann is a painter who became blind when he was his 30’s. See his story below. 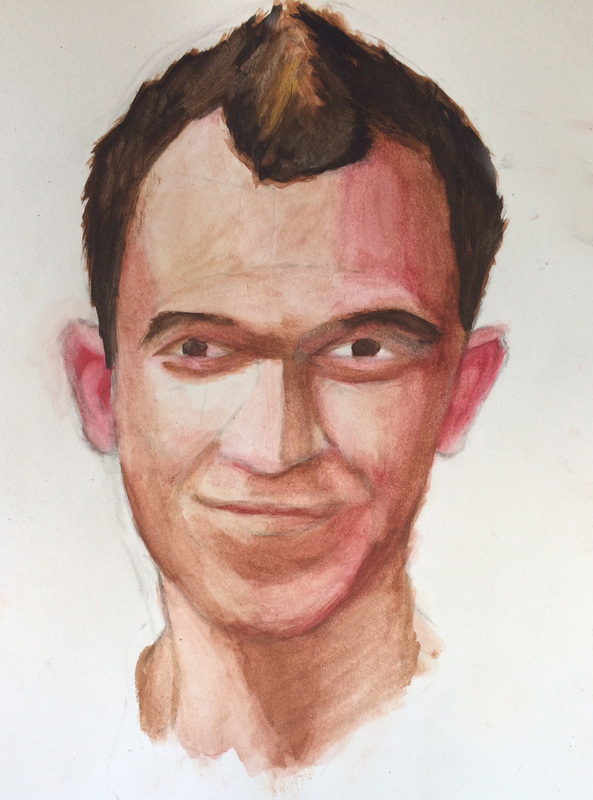 We weren’t allowed to use ink washes so it was a change for me as I had to focus on line art. The ink drawing was first done in pencil then inked using micron pens, a Lamy fountain pen, and a little Copic marker for blocking in the grass. I also use Duralar mylar which helped a lot with my learning curve for ink. Duralar is very forgiving with ink – because it erases cleanly with alcohol or the colorless Copic marker blender. My pencil draft is below. I still have one paper to go, but here are my final illustrations for typography. I’m glad we still had an opportunity to draw. Our teacher Alice had us collect together all our work for the quarter and put it into a portfolio book in Adobe Illustrator. This is a WIP (work in progress). 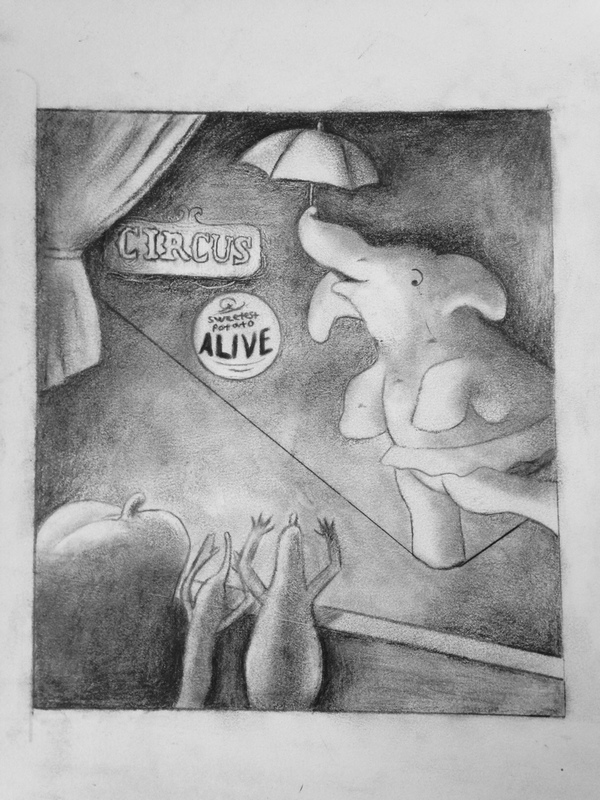 Assignment this week for Typography is designing a book cover using a previous drawing. 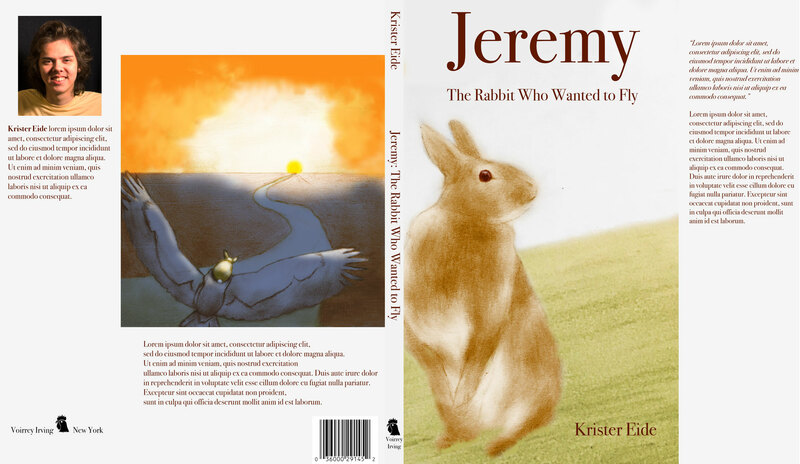 This is Jeremy – The Rabbit Who Wanted to Fly. Lots of possibilities for how this story could go. As much as I liked traditional atelier instruction like at the Gage Academy, I’ve really wanted to get more experience drawing imaginatively and using drawing to tell stories. One great exercise we had to do in my Mastering the Pencil class at RMCAD last quarter was drawing multiple thumbnails to tell a story. The prompt was an old suitcase. We had to make a story out of it. Here are some thumbnails sketching out potential characters, locations, and sequences. 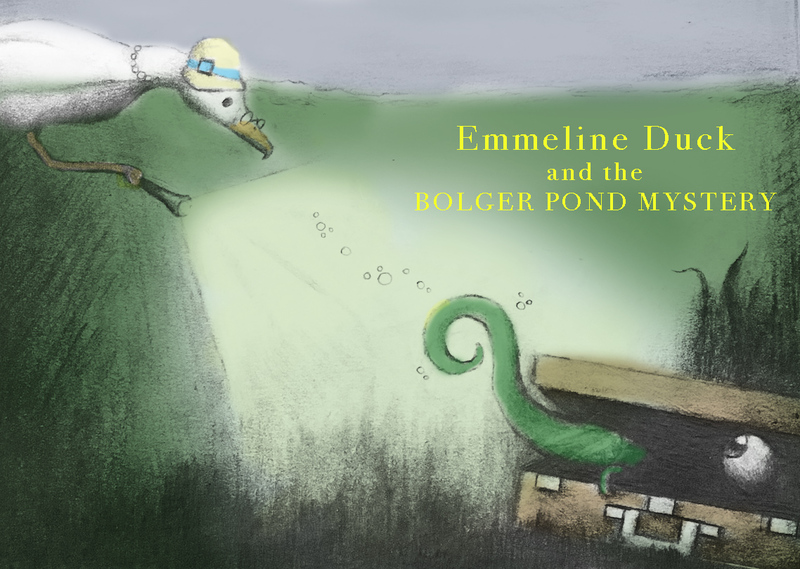 From the brainstorm, I created an Agatha Christie Miss Marple-like character, Emmeline Duck who solves mysteries like the suitcase at the bottom of Bolger Pond. As a prompt for creativity, my teacher had an assignment based on the word game Balderdash. She assigned everyone an obscure word where we were to come up with different drawings for what the word could be. My word was ‘mowburnt’. The definition I gave a mowburnt was a small singe black shrew-like creature. We had to draw 30 thumbnail possibilities and then narrow them down. This is just a preliminary sketch / WIP. Another possibility has a Horatio Hornblower-like shrew paddling a sardine can, and another, an urban shrew dreaming up a better life. 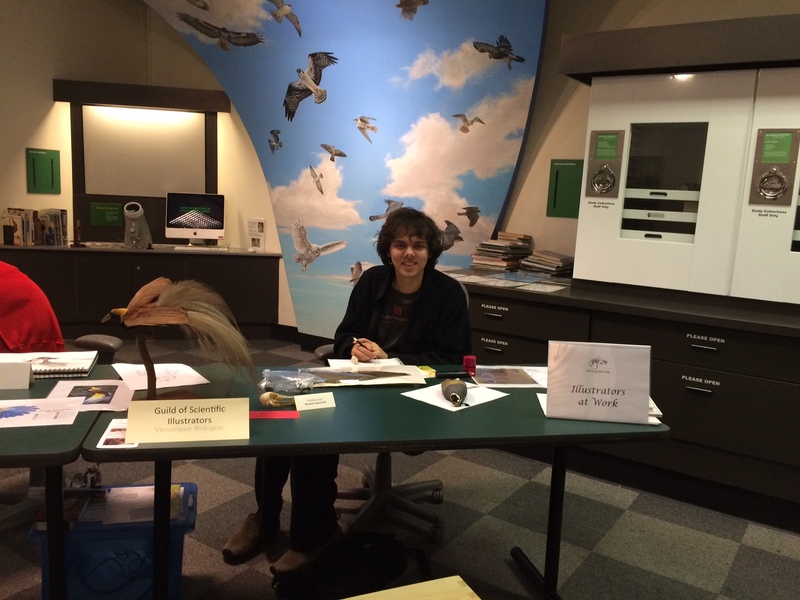 Last week, I also had chance to volunteer at the Burke Museum‘s Bird Day part of a small group from the Guild of Natural Science Illustrators. Every one was very nice and welcoming, though I was just a college student. Several explained that they had more of a science background than art when they first became illustrators. I found out the Burke museum has a close relationship to science illustrators at the University of Washington. They hold an exhibit of new graduates from the UW program in scientific illustration every year. In James Gurney‘s tutorials I learned that he does a lot of sketching and exhibiting in museums of natural history because of his interest in dinosaurs and birds. Because birds and a lot of other animals move so quickly, having time to study the structure of different and similar animals in a natural history museum can be very helpful for field work. At the Burke, I was also told that artists are at the museum almost every day working with the different departments. 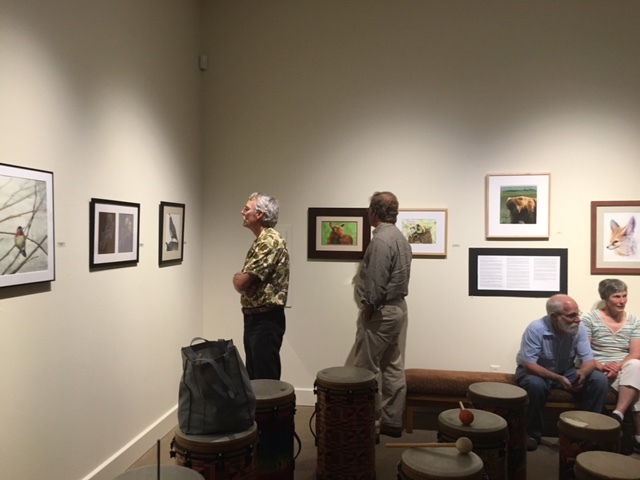 Apparently the museum employs some artists to help with their design needs and educational exhibits, but community artists are also welcome to come into the museum and work with their different animal specimens for free. 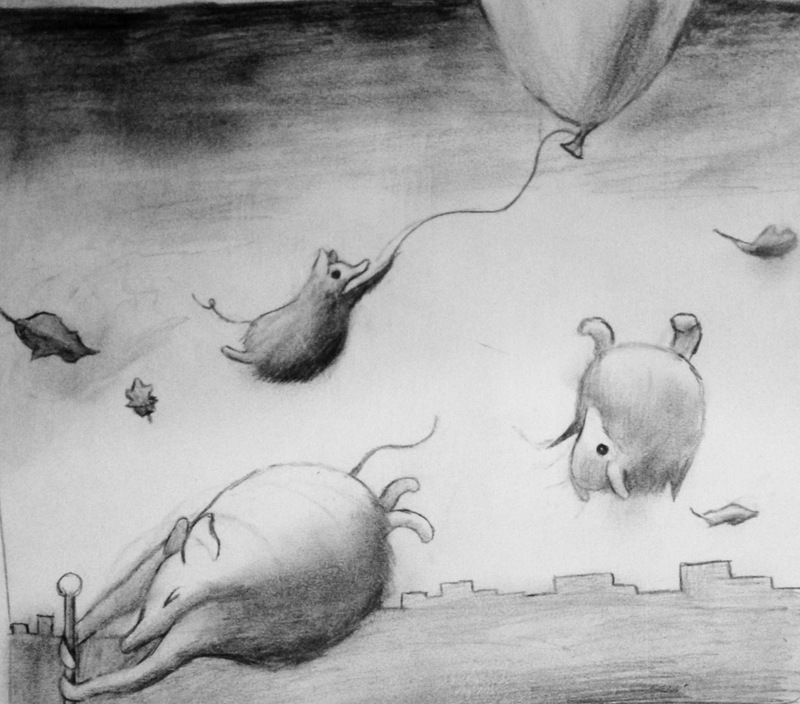 My teacher in Mastering the Pencil this quarter is children’s book illustrator Karen Windness. We had a fun assignment this past week creating a veggie or fruit circus using the real items in a diorama that would serve as a model for a pencil scene. I went to a Chinese market (lots of things looked like they could be characters in a circus) and picked out a sweet potato that looked like an elephant. It was good to have a physical model to work with to work out the placement of characters, lighting, and background elements. Here’s my sweet potato with ginger arms and legs. Here’s my drawing that I’ll submit today. I used some graphite powder for shading (Creatacolor better than General’s). 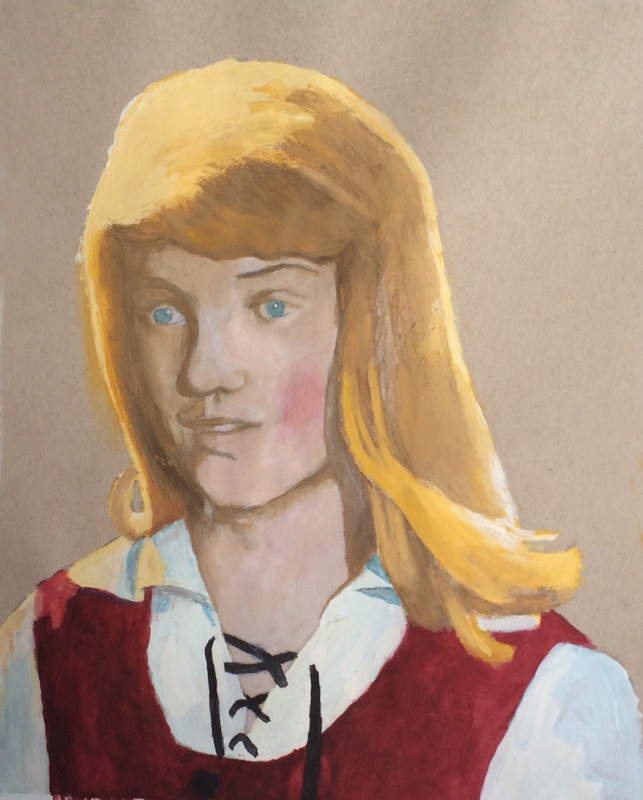 I finished my watercolor portrait workshop with Hamid at Gage Academy this past week, but I still wanted to learn more, so I checked out Scott Waddell‘s Art of the Painting video. It’s great! His demo is for oil, but most of his principles work for all classical painting. He starts off ‘posterizing’ the major lights and darks, establishes the values, then shifts into conceptualizing mode, carving the face in 3D in color. I found the method straightforward and much simpler than just trying take in all the information at once. Scott supplements his painting with video illustrations of the behavior of light on 3D surfaces. Here are 2 portraits that are more exercises / WIP rather than finished works. The girl is from this 1966/1967 film adaptation of Hans Christian Andersen’s The Snow Queen. I still have more I would like to do on that piece, but the RMCAD school year starts up in a week, and I’m going to see if I can learn more about composition before then.